Colorectal clinical nurse specialists Maria Lawson and Bernice Kent won the national awards in 2017 for their inspirational work with bowel cancer patients. Maria works for the Derriford Hospital NHS Trust and Bernice works at the Worcestershire Royal Hospital NHS Trust. 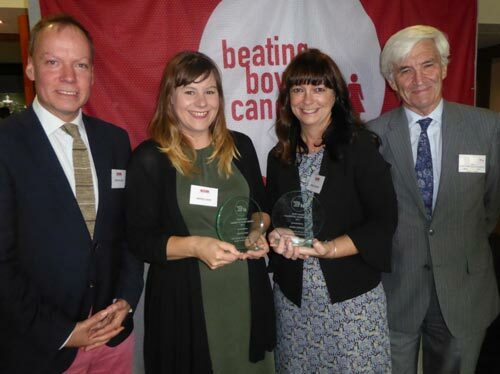 The Gary Logue Colorectal Nurse Awards were established by the charity in memory of one of Beating Bowel Cancer’s specialists nurse advisors, who sadly died in 2014. They aim to recognise those nurses who make a big difference to the lives of their bowel cancer patients. The nurses were presented with their awards by Gary Logue’s partner, Cristian Leon, and Sir Christopher Pitchers at the National Colorectal Cancer Nurse Network Conference. Their award includes a £250 bursary each towards their professional development.